How to Use Pry Bars Properly? Frequently, the choice of pry bars can turn into a really hard and lasting process. To make your life a bit easier, we have prepared a list of six best pry bar sets for both professionals and DIY fans. Depending on what you need crow bars for, they can become your best assistants in unlocking wooden crates, withdrawing nails from timber, destroying drywall and a number of other occasions. Basically, pry bars are a must have for any man no matter how often he repairs, demolishes or builds something. There is always some job, which must be done, and it’s great if proper instruments are at hand. This Stanley instrument is of good quality and is appropriate for both home and professional application. Keeping the features of classic time-tested crow bars, it can be a great aid during various projects like lifting tiles or withdrawing nails from various materials. 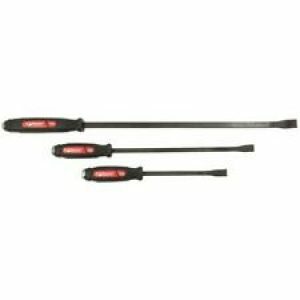 This pry bar can cope with a great amount of tasks and help you with repairing, demolishing and building jobs in addition to being an indispensable tool for handymen. Positioning accuracy is ensured by a hard bend angle. The position of the arch in the center dismisses the necessity for a wood block to achieve the demanded swinging motion. The instrument length is 15-1/2 in. That ensures extra coverage plus improved leverage. 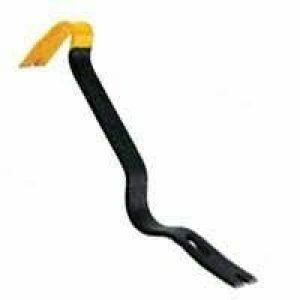 The main functions of the mentioned crow bar are easy lifting, pulling out and nail disposal. Besides its key functions, the tool may also serve as a panel lift. It can be done by equalizing the pry end under the panel and pressing the end through a foot. Thus, you will cope with the task with no troubles. The bar’s blade is 1-3/4 in wide, insuring the most productive results. The ply bar can be applied for taking out the tiles, linoleum plus plywood. Besides, the flat bar can assist you in careful removal of the tile without damaging it. The instrument is able to glide under a desk or table leg, standing on the carpet. Moreover, it can be utilized for mounting the office furniture appropriately and easily. 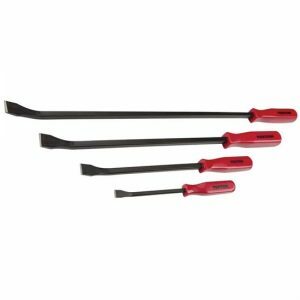 Consisting of four items, the set by TEKTON gives you an opportunity to cope with jobs of various kinds, from heavy rugged lumber disposal to delicate molding or shingles pulling out. All the crow bars are made of forged and hardened square bar. Each of them is of different size, allowing you to utilize them not only for jobs at home but also for repairing your automobile. Thus, you are free to pry, lift, place or align machinery and details in your vehicle. Square shaft crow bars provide with additional leverage while working in narrow areas thanks to keeping angled tips. Whetted gad caps freely glide into narrow spaces to set apart the details. Massive poly hands provide you with comfort while working even under great stress. Moreover, the price is very reasonable. Dominator products are among the most powerful tools. This set, containing professional pry bars with capped ends and special instruments, will be suitable for a vast number of jobs. This set of three items was created to cope with ill-use and serve for a long time. The bars feature curved ends for better leverage while being applied for narrow areas. The kit comprises Dominator 7-C (12 in oal), 12-C (17 in oal) and 18-C (25 in oal). 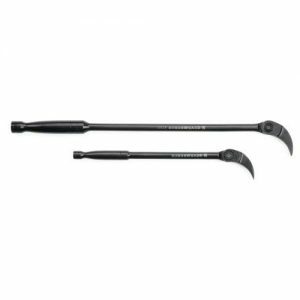 Featuring a licensed ergonomic handle, consisting of two parts, these crow bars are convenient to hold and are able to resist various temperatures, oils and solvents. The handle end keeps a metal striking cover, which is connected with the shaft, guaranteeing that the handle won’t be damaged after being struck. The item is made in the United States and holds a Lifetime Warranty. Mayhew keeps the ISO 9001-2008 certification while all punches, gads and pry bars conform to ASME B107.410-2008 standard. This product is perfect for boards disposal and will be your great assistant if you deal with demolition of old wooden floors or patios. Having a head with 2 prongs, it can glide smoothly to its target and lift a board without breaking it. Being created specifically for old deck boards, the instrument employs leverage for almost effortless and fast removal of boards. 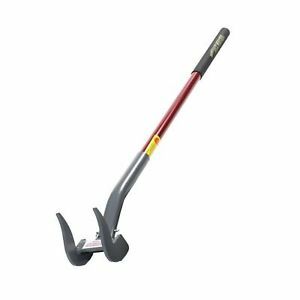 With the best leverage, the Duckbill Deck Wrecker straddles a single or double 2x timber with a steal head to pull out boards with nails or screws. It features a sturdy 51 in handle of fiberglass and a padded grip, which doesn’t slip. Moreover, the head easily rotates 180 degrees and allows applying the instrument in two directions. So, it can be easily used no matter what job you do. Additionally, the deck wrecker is resistant to corrosion and may serve for ages. It can also assist you in pulling crate or lath, plastering off ceiling balks, prying up plywood or old subflooring boards, displacing wall covering. The items are made of tempered square steel and feature striking caps of black chrome, which allow striking hard without breaking the handle. The dual durometer handles make the working process comfortable along with reducing hand weariness. Keeping a tip covered with black oxide finish, the tools are able to serve for a long period plus confront rust and wearout. This pry bar set is great for professionals. 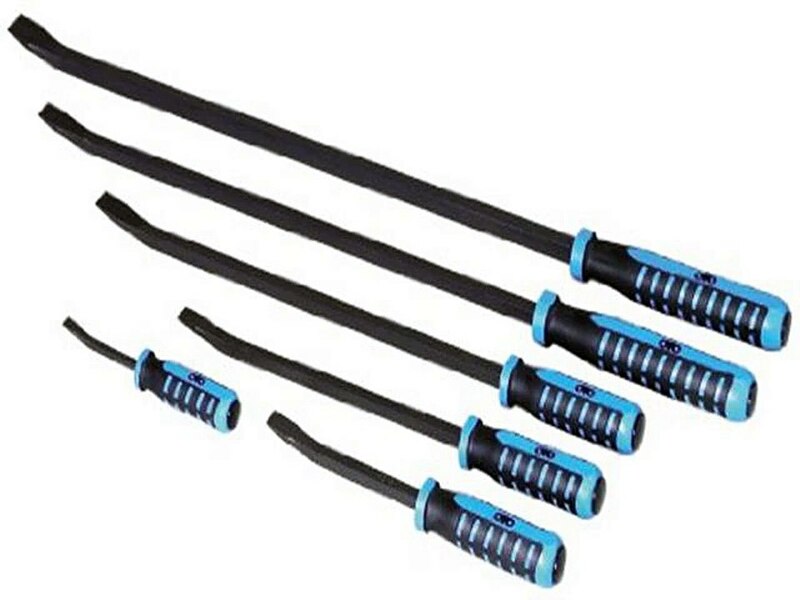 The crow bars feature tempered steel shanks and striking caps on the back of rubber grips. In such a way, you are free to hammer on the back of the bar to set captured elements free. The main plus of this kit is that it allows solving problems efficiently and fast no matter if we talk about minor repairs or complex projects. 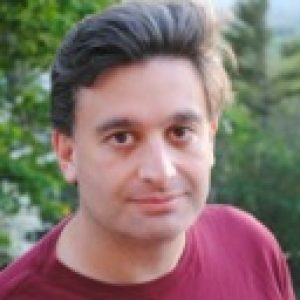 Moreover, it’s a really great tool for automotive services. If you have to do with versatile jobs, the ApexTool GearWrench will help you to perform various tasks. If you need additional leverage, you are free to extend the tool to 48 in or, otherwise, shorten it to 29 in while working in narrow areas. GearWrench is a prominent brand, manufacturing hand tools. Its product range meets all the requirements of industry workers and auto mechanics. These crow bars can be applied for motor replacement, steel details alignment plus equipment re-position. Depending on your demands, you are free to opt between two tools series. The premium crow bars feature indexing heads and are very versatile in application. They are sold in the sizes 8-33 in with standard handles plus in 29-48 in sizes featuring extending handles. Though a pry bar isn’t pricking or cutting, doesn’t contain blades or moving details and seems to be rather safe at first sight, this instrument must be used carefully. If applied improperly, it’s able to cause injuries. So, it’s highly advisable to find out how to behave with such a tool. Primarily, consider your working place. It’s great if you have an opportunity to work in a clear space away from other people. While demolishing something, debris can be thrown into the air and can hit someone. Besides, it’s important to create a secure atmosphere at the working place. Thus, avoid placing objects on unsteady bars and trying to press them. Appropriate protective accessories like goggles, gloves and work boots are also necessary. Furthermore, if the crow bar breaks, don’t utilize it anymore as it can cause injuries. For instance, if the pry bar tip is spoilt, it may jump off and hit you or someone else. If the bar is distorted in the center, it may fracture if you press on it. Thus, you can get injured or fall. Try to examine your instruments before every task to make certain that they are in order. It’s crucial to opt for the proper pry bar demanding on what job you are going to do. For instance, if you buy a weak crow bar, it can bend or fracture if the work is too tough for it. Besides, ensure that you inset its end solidly between the things you are going to pry. And finally, never allow the object you pry to be faced towards your body. Thus, if the top must be removed from the crate, don’t inset the instrument to pull it down as the top may hit you while tearing off. You’d better place the bar, allowing yourself to push away from you and the item will fall on the other side. Moreover, don’t jerk the crow bar. Perform the job with smooth movements.